Many of you may recall that I was the primary care-giver for a victim of Alzheimer's Disease - specifically, my mother-in-law who I affectionately referred to as "Mumsie." I wrote a few pieces that appeared here on ePluribus Media as well as other places, often sharing thoughts / feelings and happenings about the ongoing experience, or reflecting upon it after her passing in December of 2007. Some of you may recall that I mentioned working with someone to co-author a book about the experience. Well, the book is complete. It's now available via Amazon.com in both print and Kindle format. It's Her Final Year: A Care-Giving Memoir. We think that anyone facing prospect of - or currently engaged in - the care-giving role for a loved one suffering from Alzheimer's disease may find the experiences we relate within to be of use and interest. 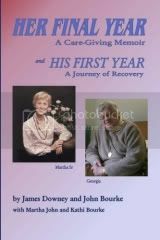 If you know anyone who you think may benefit, please pass along new of our book and the website URL (herfinalyear.com).